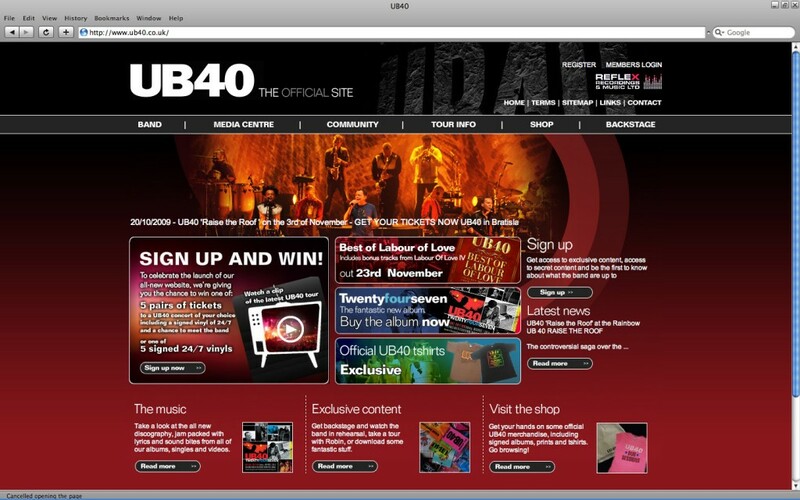 All of us at Rapid Web Services are pleased to announce the launch of the new UB40 website this week. The redeveloped web site went live this morning, after months of hard work. We’ve been working with UB40 over the last year to give them a new website that matched their stature in the music industry, we are very happy to be supporting such a successful British Band. We’ve been lucky enough to see them play live in their home city of Birmingham recently and they put on a superb show, they are such a great act to see live. The site has gone live in time for UB40’s upcoming European tour, and coincides with the release of “The Best of Labour of Love” album. The new website utilises Rapid Web Services’s bespoke e-commerce system and our very own content management system. These systems allow UB40 to control the vast majority of their own site for the first time. The site has been designed with the fans in mind to fit with UB40’s well publicised political and social beliefs. It includes an improved and upgraded forum, fully searchable discography, tour information, back stage area and competitions to win tickets and merchandise.